One of the suspects on trial for the June 23 assassination attempt on the life of Ethiopia’s Prime Minister, Abiy Ahmed was the anti-terrorism head with the Ethiopian National Intelligence and Security Service (NISS), the country’s spy agency. Tesfaye Urge, one of the about 30 suspects arrested after the June 23 assassination attempt on Prime Minister Abiy Ahmed, was a person with an oxymoronic title of the head of the department for the anti-terrorism task force with NISS. 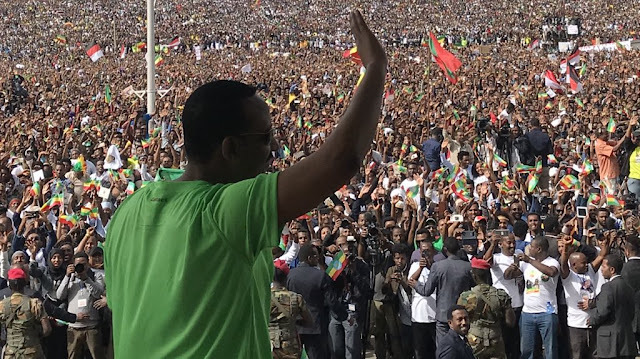 Dr. Ahmed had just finished addressing a jubilant crowd at Meskel Square in the capital that was gathered to show support for political reforms undertaken by the young Prime Minister when a loud explosion led security forces rush the Premier to safety. A man was trying to hurle a bomb in the direction of the podium where the Prime Minister and other dignitaries were sitting but was tackled by another man. The bomb exploded in the scuffle killing two people and injuring over 150. An investigation team of the Federal Police say the June 23 assasination attempt was the work of Tesfaye Urge, while he was still running the department of the anti-terrorism department task force with NISS. The court gave police additional 7 days and also denied bail to the suspect. Girma Kassa, who was the deputy commissioner of the capital’s police is also one of the officials suspected and arrested after the assassination attempt. Kassa is also accused of torturing imprisoned journalists and critics of the TPLF regime when he was in different capacities at the city’s Police Department. In the early stages of the investigation in June, 17 police and security officers, some of whom were in supervisory positions, were arrested for showing security lapse during the rally in support of the Prime Minister. They are now being tried for involvement in the assassination attempt.